Home / Handsome Dan’s Rescue / Programs / Take My Lead"
This program is generously funded by our supporters who, for a cost of $300 – $500, can sponsor a Take My Lead program recipient. 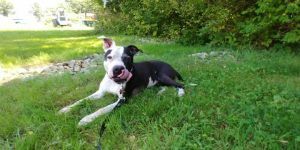 Take My Lead provides training and behavioral support and supplies for a recently adopted dog as he transitions into his adoptive home. A certified dog trainer or behavior consultant meets with the adopter privately to work on previously identified behaviors or those that present as the dog is transitioning. Handsome Dan’s Rescue is proud to have some of the area’s most talented professionals involved in helping dogs who need a little “extra” to find their happily ever after while empowering their new pet parents with the necessary tools to set their new dog up for success. Each of the trainers/behavior consultants in the Take My Lead program already provides extensive volunteer hours to animals. Their highly valuable time and expertise is paid for through generous donation to the Take My Lead program. For many, the Take My Lead program is the difference a borderline adoptable dog needs to become a loving, family pet. If you would like to sponsor a dog in the Take My Lead program please consider a donation between $300 and $500 per dog. Please click on the donate button here. Take My Lead dogs are identified by the Executive Director based on need and behavioral issue, and chances of keeping a dog “adoptable” by enrolling him or her in this program while weighing need across all of our partner shelters and our own foster care program. Our involvement and partnerships with so many local shelters gives us a unique perspective in that we are able to weigh need across the state and beyond.